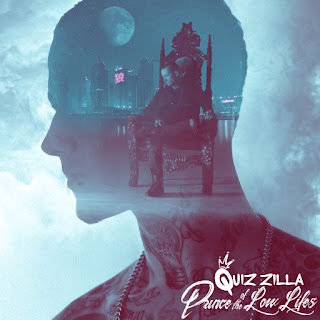 Home Billboard chart portland Quiz Zilla (Album) Quiz Zilla - "Prince of the Low Lifes"
(Album) Quiz Zilla - "Prince of the Low Lifes"
Everyone has their reasons for wanting to be a success, most of them self-serving. Portland, Oregon's Quiz Zilla hopes that his success will enable him to help lift the downtrodden and disenfranchised; to whom he unequivocally relates. Surviving a nightmare childhood of broken homes, homeless shelters and foster care imbibed Quiz Zilla with an abiding sense of empathy that has shaped him both as a man and an artist. His songs come from a deep place which enables him to cross genres; wherever the mood takes him. As he puts it, “If it speaks to me, I’ll make the music.” Not one to succumb to labels, Quiz Zilla doesn’t even prefer to be labeled as a rapper — he’s an artist, first. “I don’t like being placed in a box,” he explains. Listeners can expect a little bit of everything from Quiz Zilla as his debut album, "Prince of the Low Lifes" will demonstrate. His latest single, “Still Have Faith,” is a testament to his versatility. The song is about a relationship that has endured a rollercoaster of emotions and challenges. Break-ups and make-ups make for an aching protagonist, until he realizes that he still has one more try left in him. “It’s about struggling to set pride and ego aside and let the love shine.” The title of the song speaks for itself: “at the end of the day I ‘Still Have Faith.’” The song recently hit #1 on Neilsen's Hip Hop/R&B Chart and currently sits at #4 on Billboard's Hot Singles Sales Chart for a second week. Quiz Zilla makes music that resonates with people. It speaks to them exactly as it was intended. That, after all is what true art is all about.